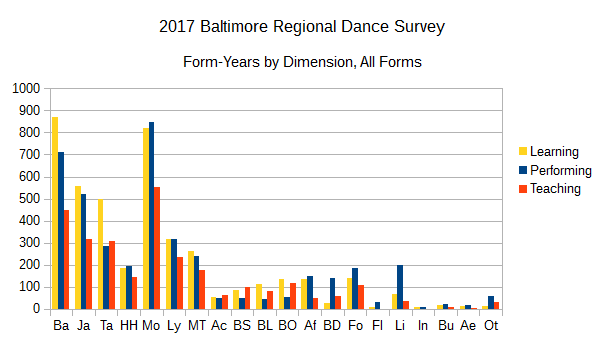 In the last installment, I did a broad overview of what sorts of dance happens in Baltimore, in three dimensions (Learning, Performing, and Teaching). This time, I’ll focus a bit on the level of engagement for the three dimensions (Learning, Performing, and Teaching) within each dance form. In general, I would expect that people learn a dance form first, then maybe start performing, then maybe start teaching. In some forms (Ballet), progression to the stage and to teaching may be highly dependent on the blessings of one or more teachers, while in others (Belly dance, Liturgical), it’s more likely that the decision to perform is entirely personal. 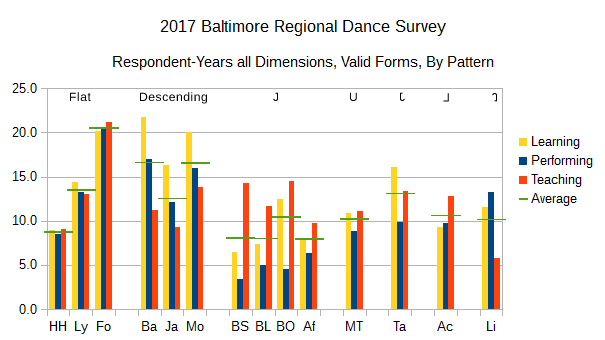 In some forms (Folkloric, Indian), local advanced learning opportunities may be extremely limited – if a dancer is committed to a form, and there isn’t a “next-level” instructor around Baltimore, they will have to go elsewhere to take those next steps. In some forms, where there only a limited number of instructors teach in the region, training may simply stop after a short period of time. From here, a quick look reveals some interesting relationships. Hip Hop, Lyrical, and Folk forms have essentially the same commitment to learning, performing, and teaching. 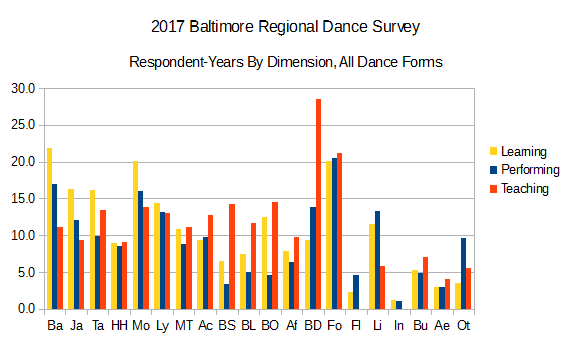 This isn’t enough to say that Hip Hop is modern American folk dance, but it was interesting to see these two together (and Folk dance in this survey does cover a lot of territory). Ballet, Jazz, and Modern follow a straightforward descending pattern through these dimensions (More learning than performing, and more performing than teaching). 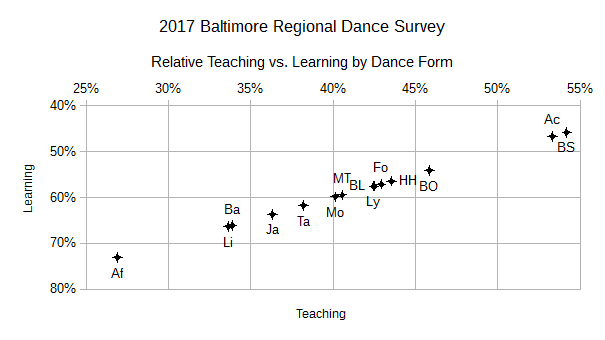 All of the Ballroom forms, plus Musical Theater, Tap, and African follow a “U-shaped” pattern, with less time spent performing than on either learning or teaching. The Ballroom forms and African make that more of a “J” (more teaching than learning) and Tap sort of flips that J backwards (more learning than teaching). Acro alone inverts the descending pattern of Ballet, with emphasis on teaching, so more of a backwards-L shape. The last pattern in this set – Liturgical where there’s much more learning and performing than there is teaching. Perhaps Liturgical dancers take more of an on-the-job approach to learning their craft (or we just missed the instructors). 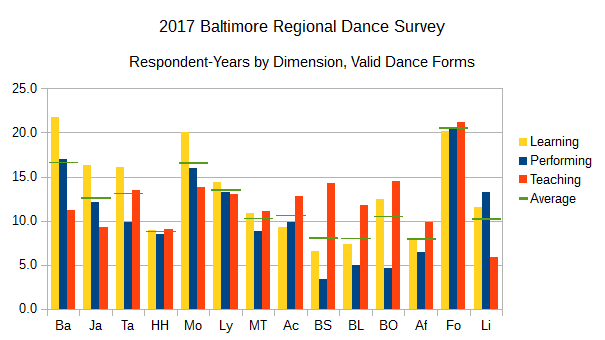 There are some form-specific implications – for example, Musical Theater dance is just a part of a Musical Theater career (acting and singing lessons aren’t captured in this survey), and Liturgical dance classes may not involve much economic activity for either teachers or students, but… interesting. Standard Ballroom and Acro stick out in the upper-right end of this chart, and are the only two where Teaching years exceed Learning years in this dataset, but probably for different reasons. African also stands out at the opposite end of the chart, and I don’t know why – probably in part a sampling error (only 5 respondents spent any time teaching African).